All rentals come with a SIM card with unlimited internet access, charger, cable, and we deliver to and collect from your event 🚚🚚🚚 for your convenience. We provide a complete event management solution: Mobile Check-in and Badge Printing📛, and Survey Solutions. Turn your iPad into an interactive information center. Apple’s robust iOS architecture and intuitive Multi-Touch interface make the iPad tablet ideal for use in commercial and high-traffic locations. Play videos, present PowerPoint and Keynote slideshows, display product brochures. Check in attendees and print badges for delegates directly with our powerful suite of event tools. Engage your audience with live Q&A. No microphone needed - questions are flashed live with the option for moderation if needed. Project your iPad’s screen to your HD TV and onto a projector screen easily with our adaptors. Enjoy unlimited internet connectivity with 3G and WIFI. No need to set up a wireless station. A security case with lock, key, and cable will protect your rental. Engage customers and visitors face to face and connect with them online at the same time. We will get back in touch with you quickly. Alternatively, you may use the form on the left. Rent the latest iPad 9.7” (2018 Model), the iPad Pro 12.9”, the iPad 2017, iPad Air 2 and iPad Air from TouristPads. We provide the latest and best technology to support your event. Our consultants will work closely with you to find the best solution for your needs and assist with all aspects of implementation when your rent our products. Our security cases incorporate a lock, key, and steel cable to ensure that your rental is protected soundly. Security case with 360° flip stand (Black) for iPad 9.7"
A robust and sturdy rotating stand ensures a versatile and yet secure use of your rentals. iPad security case side view. Security case lay flat (Black) for iPad 9.7"
for iPad 9.7" / iPad Pro 12.9" / Samsung Tab S2 9.7"
Table top pivot stand (aluminium) is compatible with iPad 9.7", iPad Pro 12.9", and Samsung Tab S2 9.7". Table top pivot stand (aluminium) is angle adjustable and can be put in either portrait or landscape. 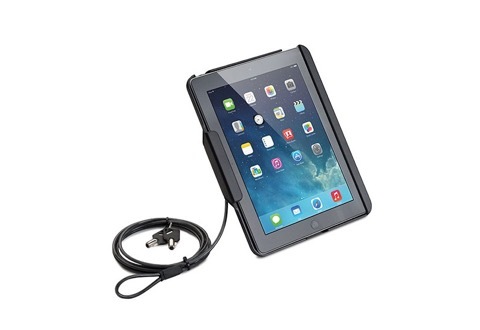 The iPad is secured by a lock belt (pictured here), which will can be attached and detached from the table top stand. The lock belt itself can be secured with a steel cable, lock, and key, protecting your rental. 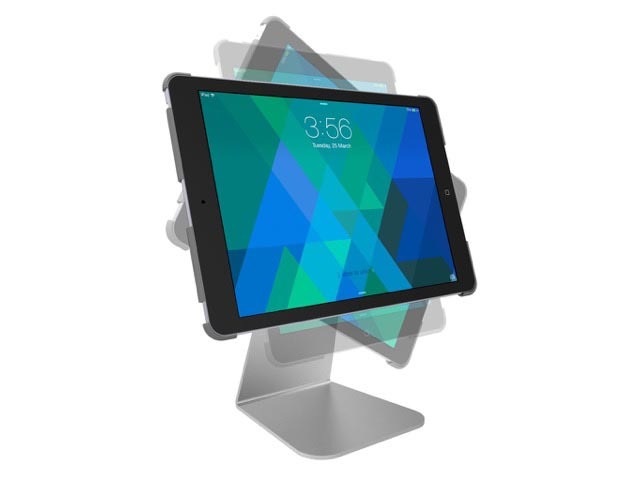 Drilldown Table Top Stand (Aluminium) is compatible with iPad 9.7", iPad Pro 12.9", and Samsung Tab S2 9.7"
Drilldown Table Top Stand (Aluminium) can be put in either portrait or landscape. Your device is secured without any extra security cables for a seamless and beautiful customer experience. Table Kiosk / Stand for iPad 9.7"
Drilldown Wall Mount (Aluminium) is compatible with iPad 9.7", iPad Pro 12.9", and Samsung Tab S2 9.7"
Mount in either landscape or portrait. Turn your iPad into an interactive information center. Our clients have found the use of the kiosk an ideal solution as an information center in high traffic and commercial locations. 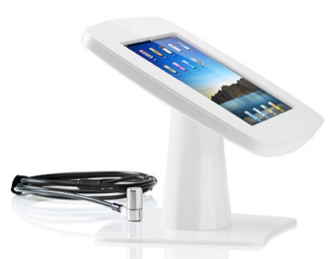 Floor Griffin Kiosk (White) for iPad 9.7"
Floor Proper Kiosk (Aluminium) for iPad Pro 12.9"
also compatible with the iPad 9.7" and the Samsung Tab S2 9.7"
Proper Floor Kiosk (Aluminium) is compatible with the iPad Pro 12.9", iPad 9.7" and the Samsung Tab S2 9.7". Our VGA and HDMI adapters from Apple will allow you to mirror your iPad’s screen to your big screen. Now everyone can see your presentation, website, apps, and even videos at the same time. We've served hundreds of clients in Singapore and internationally, and have received many positive testimonials from our clients. Since we launched our business on 18 July 2012, we have established ourselves as the premier iPad rental company in Singapore. We commit to providing you with the best customer service, responsiveness, technology, support, and competitiveness in the market. "Very, very impressed with the service, price, and very simple order/reservation process… In a word!, Brilliant." — Mr D.
Our iPad rental service and products have been featured in the Straits Times, CNN, IS Magazine, Singapore Business Review and various other media. To learn more about how our iPad kiosks/stands can help you, we have written a case study on the use of our kiosks/stands for the Singapore F1 Grand Prix event. To download the case study, click here or on the image. We provide event apps and software to make your event an even more successful one. Having supported hundreds of events in Singapore, we are your confident partners in making your event, conference, seminar, or town hall meeting a roaring success. Print custom badges for attendees as they arrive. Conduct live polls, and collect survey data on the spot. Our solution is optimised for quick set up and integration with your event. Check your guests in with mobile check-in or let them do it themselves with a self check-in kiosk. They simply have to scan their QR codes or key in their registered email address. You can also print out a name badge for the guest on the spot as well. Engage your audience and encourage them to ask your panel questions. No microphone needed - questions are flashed live with the option for moderation if needed. There’s nothing like a good soundtrack to give your guests a memorable night! Engage your guests by letting them be the DJ at your event. They can choose songs to be added to the playlist at your event! Here are some of the most common, useful, and (mostly) free apps our clients use for their events. We can pre-install these apps or any other app you want upon request. We can be reached at 9756 1234. Alternatively, just drop us an email at info@touristpads.com, or fill up the form above. We’ve delivered our iPad products to hundreds of businesses and tourists in Singapore. To find out more about renting our iPads for your business event, drop us an email today at info@touristpads.com.